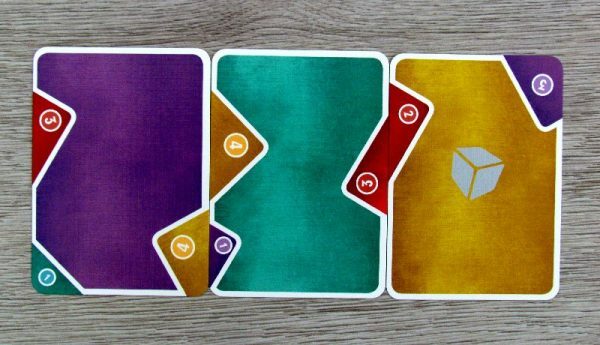 Each card has four corners. And most of them just lie side by side. That’s usually the case, but not in Conex. 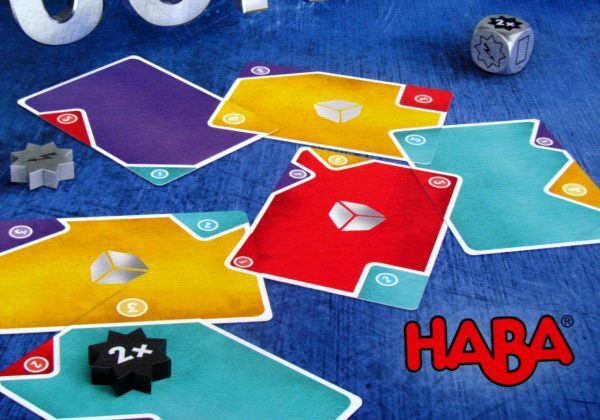 Designer Prospero Hall prepared it for the players and added it to HABA game series, that is called Game Night Approved and should mean, that this game from children-oriented company is suitable for gamers. 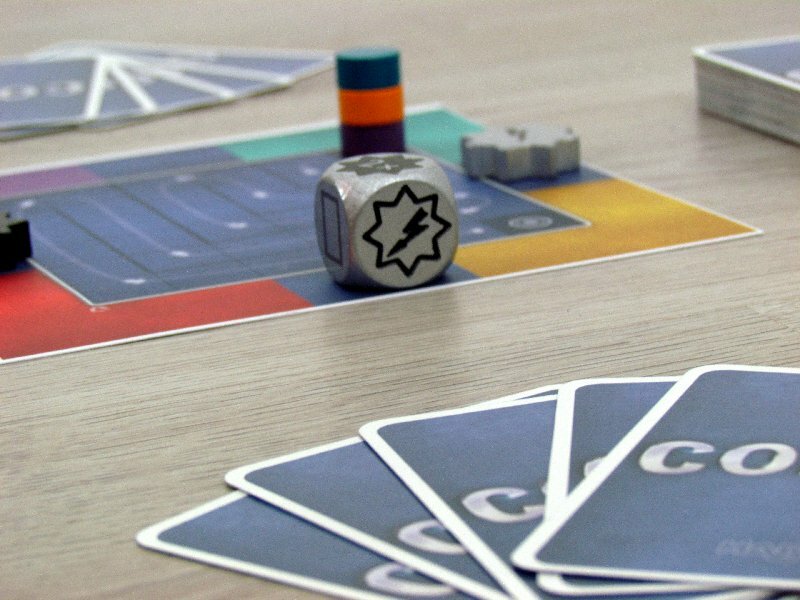 This is a novelty introduced at the Spiel 2017 fair in Essen. The whole game is hidden in a small blue box with a preview of the game. Looking at the corners of the overlapping cards, you’ll start to know a little bit of what’s waiting for you. Inside there are a total of 52 cards, that have a colorful background, and one or more cutouts of different color on the sides. 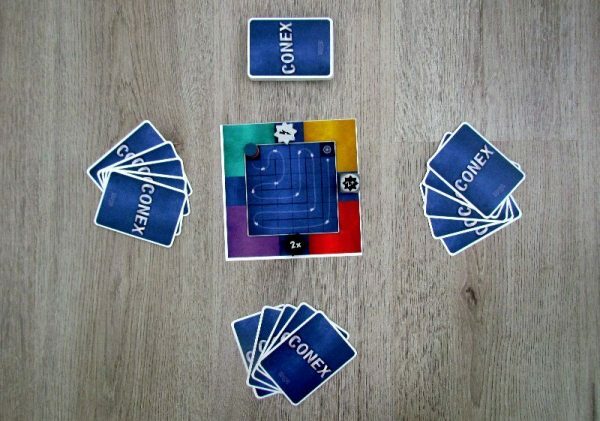 The players shuffle these together and give each participant five pieces. Nobody must show, what he was dealt. Together, the players prepare the starting area created by scoreboard and each place token of their chosen color on the starting scoring space. This board also serves as a starting point for card placement. Players have two actions to choose from. 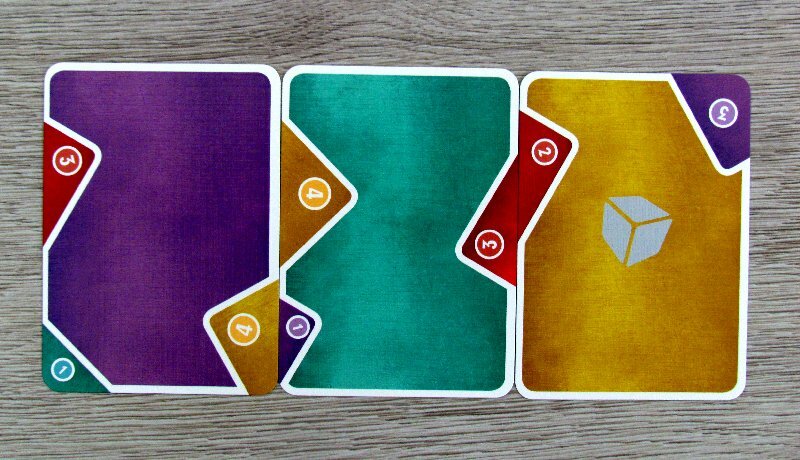 The simpler is to draw new two cards, which ends the player’s turn. Usually, however, the main activity will be used. That is playing one card from hand. 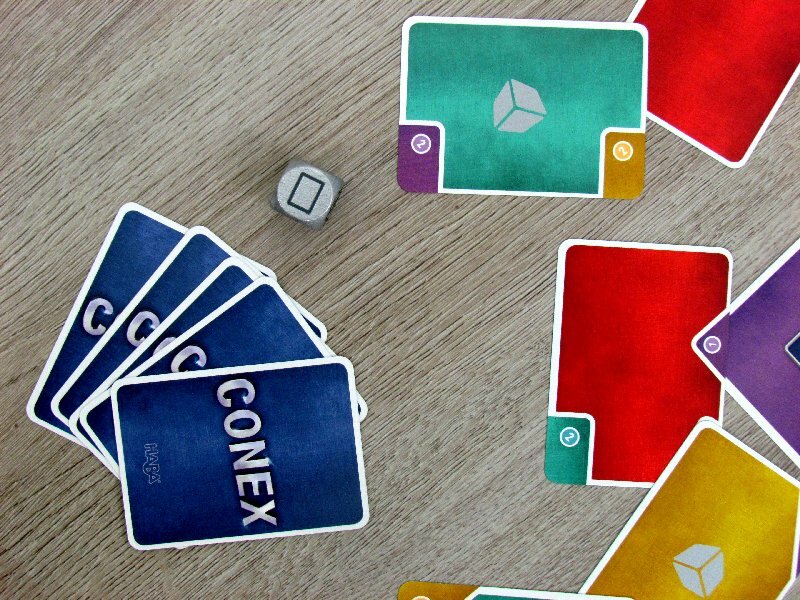 And here the rules are clear – the card can only be attached to one of the corners and over dent of the same color. This success is rewarded with as many points as printed on this colorful cutout. Player moves his wooden pointer on the scale and play continues with another turn. At the beginning, the players are connecting to the scoring board, but with more cards, game area starts to expand on the table and take up some space. In most cases, cards must not overlap, which makes space requirements even higher. 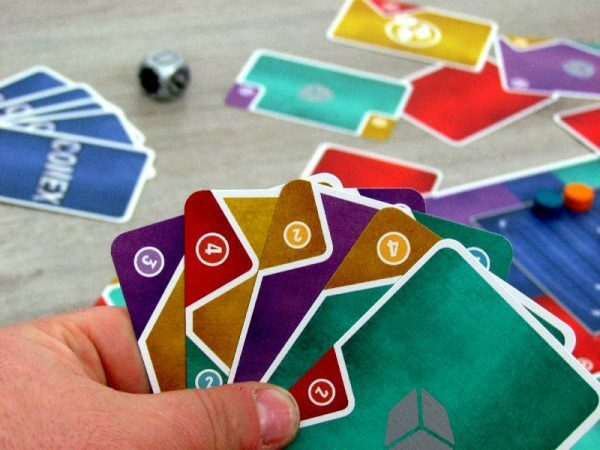 Special action cards will also hit the game, which will double the points gain from one card or allow players to remove one card from the table and place it on top of the deck. After a card is played, its owner will get a token, that allow him to perform one or the other of the actions, but only in the following rounds. Meanwhile, however, other players may be able to steal this opportunity from them, if they own and use the same action card. In the game, there is only one wooden token from each action. Players fight as long as one of them does not reach end of the scoring scale. 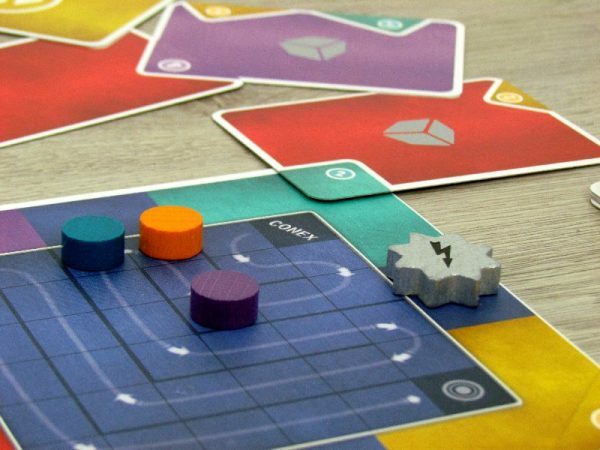 The game may end prematurely even, if playres reach their space limit on the table. 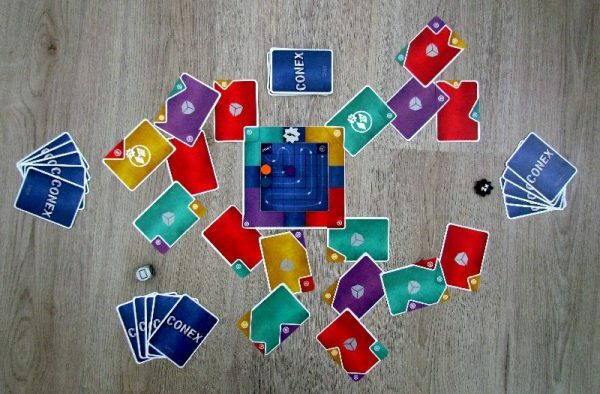 Since the beginning one player was marked as starting player, so they continue playing, until everyone has the same number of turns. At that moment, the one who has the most points, becomes the winner. Conex is an exciting experience in which players need luck, when drawing cards. 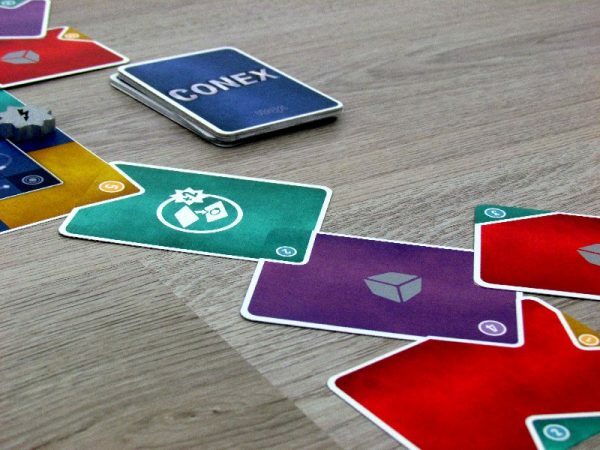 Fortunately, even if you do not have the right cards, you can fix the situation quickly by getting two instead of your regular turn, and then it will get better. Card overlay is an interesting and unseen mechanism. 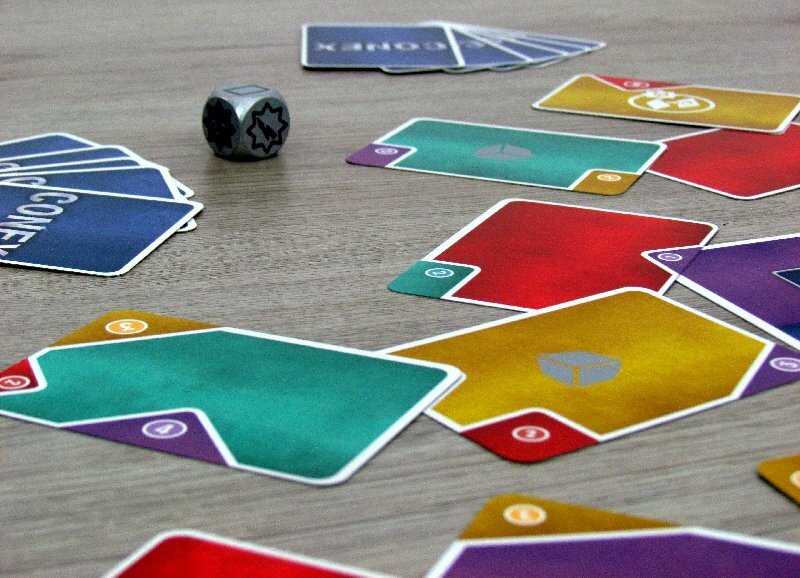 During the game, the number of possible placements increases considerably, even though the cards can not overlap. 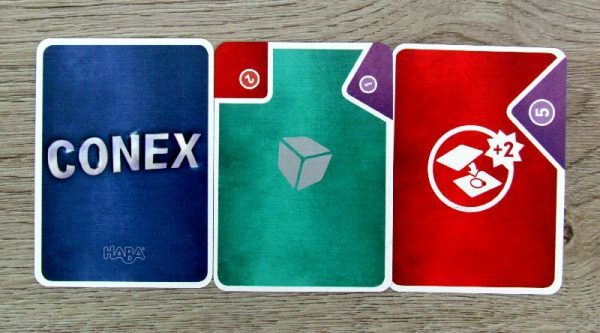 The exception is the +2 card, which on the other hand provides a point bonus, when its placed as overlapping. But as dozens of cards are played, the table size claims are really distinctive. 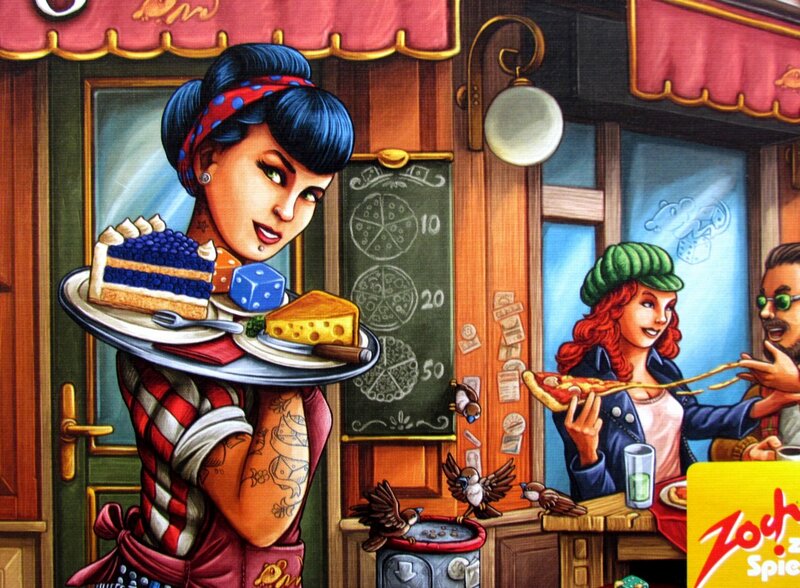 Fortunately, the rules think of it and simply tell players, that the table’s edge is a limit, that can not be exceeded. The smaller the table, the more exciting and faster the game will be. But for the right experience, a bigger table is better. Simple rules mean that everything is beautifully straighforward. 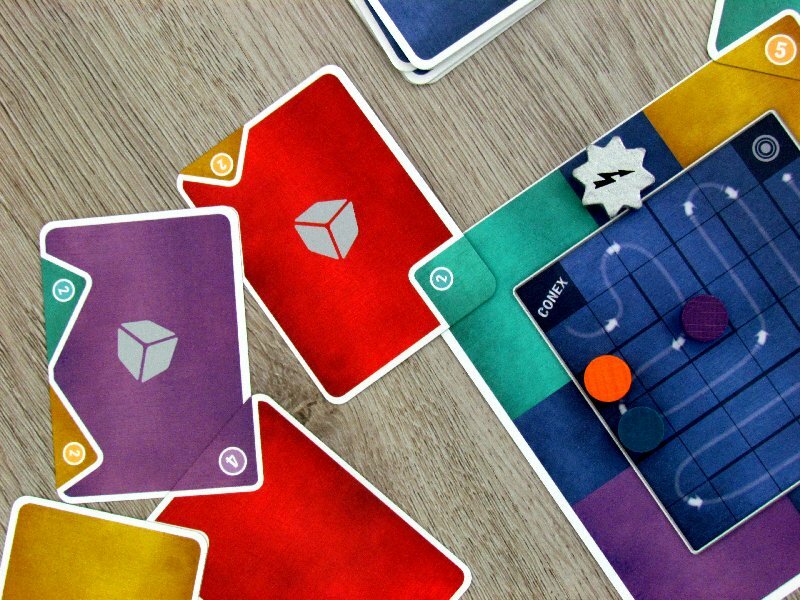 Players can pick their card positions during turns of the others and search for options. 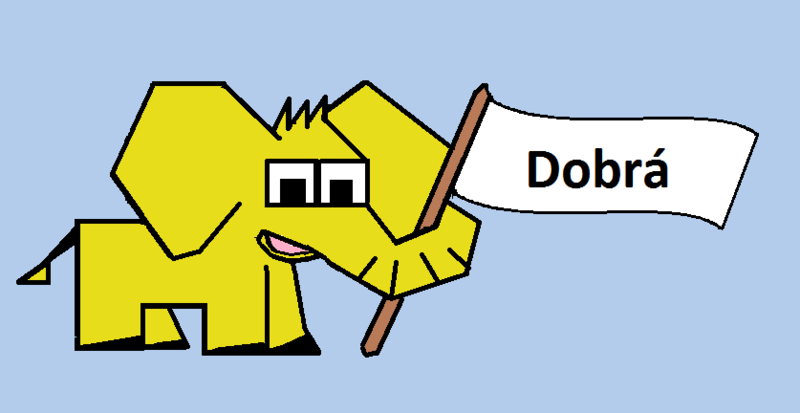 This is needed, because then everything runs much smoother. It is good that players always have the same number of rounds before the game closes. This makes everyone’s chances the same. Players may even need a dice. If they place a card with its silhouette, they can roll it to determine an effect. 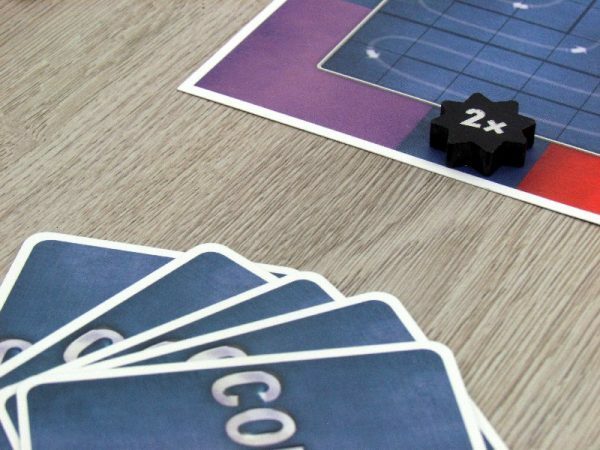 Participants then feel more in action with fewer attendees, but thanks to the short turn time, gameplay is very good even in the highest number of four. Conex is a colorful game, but its difficulty does not match its ranking for gamers. 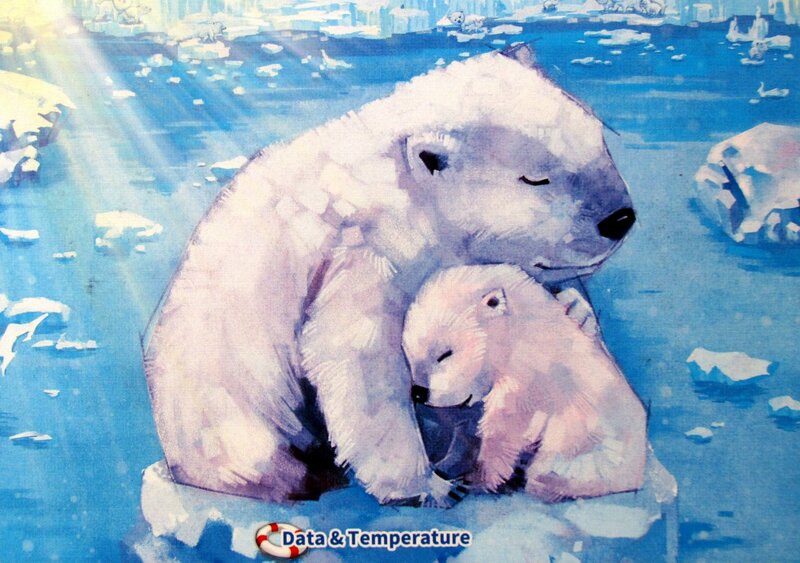 On the contrary, it is better for family play and even for children. All you need is color recognition and clever fingers. Older schoolchildren will surely be able to do this. 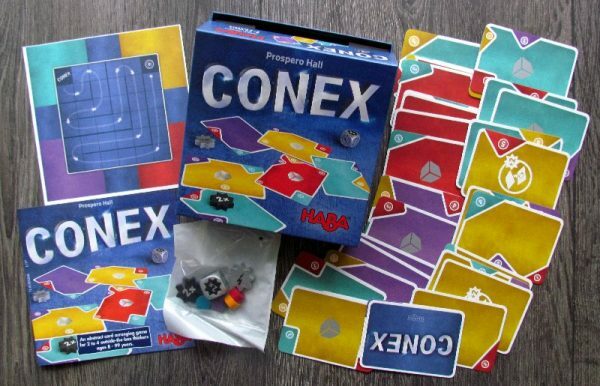 And just like that, Conex becomes another of many exciting games, though the coincidence plays quite a role in it. 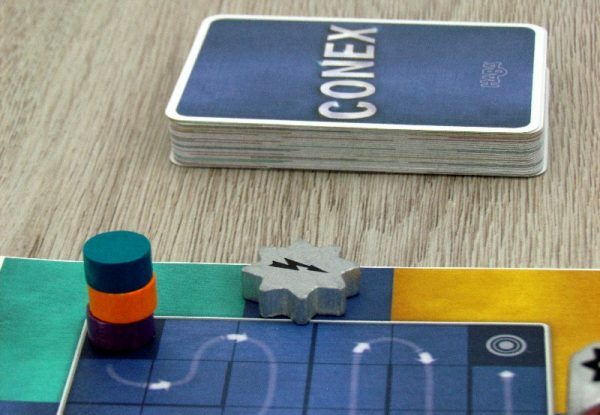 Conex is a nice family game for occasional rivalry. Card overlaying and color corners are an exciting feature, that will give players a good deal of fun. It's about collecting points, where you need luck. 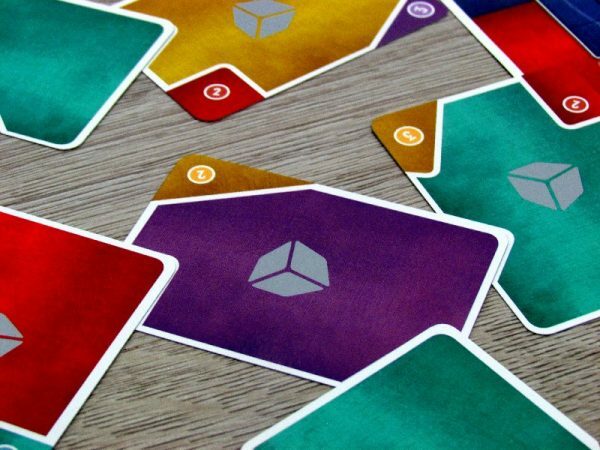 Interactive action cards will hit the game and everything is beautifully dynamic. Conex is not an extraordinary game, but it is still a very good fun. And that's enough for success in this category.